Surrealism – the most mysterious and absurd art direction. 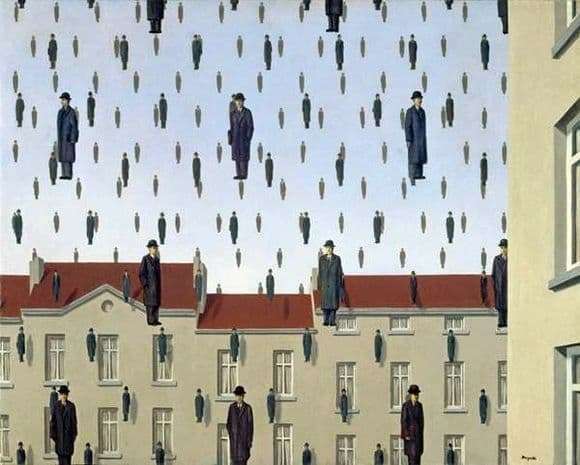 Often similar to advertising posters, unusual and paradoxical, the paintings of Rene Magritte belong to the surrealistic style. However, the author attributes them to the so-called “magical realism.” The only thing is that his creations always attract attention, slam into the memory and make everyone think about something of their own. Cloth “Golkonda” – a series of mysterious works of Magritte. It dates from 1953. At first, the design of the painting may seem unclear. If one turns to the interpretation of the name “Golkonda” for help, it turns out that it denotes an Indian city where large diamonds are mined. But the fact obtained clarifies the image a little. After all, often the surrealists called creations by any names not related to the plot. Is that the location of the figures on the canvas may slightly remind the special structure of the diamond. To understand the idea of ​​the author, you will have to plunge into the world of free associations. The famous character of the artist’s paintings is a gentleman in a suit and bowler hat. Here it is duplicated countless times. If you look closely, then every man in the picture is at least something, but different from the uniformly dressed fellows. This traced the fact of the individuality of each person, despite the initially apparent sameness. Gentlemen of the artist depicted hovering in the air in perspective. Some of them cast shadows on a building with identical windows. The combination of urban landscape and allegorical scene looks great. One can see a one-faced crowd in Golconde, but even with all the multitude of people and their striking similarity, everyone feels lonely. With the help of uncomplicated images, the Belgian surrealist showed a strong human experience. René’s famous painting is in a private collection in Houston.